If there is one thing I have learned about traveling its that it helps you build character. Every time you leave your home you let yourself emerge in different cultures, foreign landscapes, new wildlife experiances, different sleeping patterns, new food. It can all be so exhausting at times and you just want half a day off. For me I push everyday I'm on the road to shot and travel as much as I can in a day. After my East coast trip I wanted a day to rest but I also wanted to see Kevin and his loons. I arranged this visit a month ago so we put our tiredness aside and drove 1800 km up to the cottage to stay 2 nights. The reward almost had no words to describe it all! There could of been lack of sleep involved that made me feel this way but the experience says it all. As we travel the roads of the north we have our first sighting of a moose traveling across a pond into the bush. Of course we had no time to react with our cameras but it made us feel like we were in our element. We drive up the cottage road and find ourselves at a place my mind recognizes as a home away from home. My guard drops and I start to feel relaxed immediately. We go to bed early so we can get some rest while Kevin finishes up his workshop with a few clients. The following morning my body screams wake up Chris you are at the cottage! Im up now and I make myself a coffee, Im sitting on the deck while my brain tries to cut the fog on a nice sunny morning. Here its just me and nature, White eyed Vireo, 2 Yellow bellied sap suckers, Blue Jays, Ruby throated humming birds and a mother feeding her baby grackle at the feeder. The chipmunks hear my feet on the deck and come running like morning clockwork for their peanuts. Butterflies landing on the trees around me as dragon flies fly past the deck. At this point I'm starting to realize I'm in my element, also that some areas just seem to have more wildlife then others in this Country. Kevin finishes up his morning session with his clients and he asks Jess and I if we want to go out and shoot the loons. Never saying no to photographing wildlife we grab our gear and head out to the boat. I'm not sure I was ready for what I was about to see but I had jumped in with both feet and was ready for the experience. 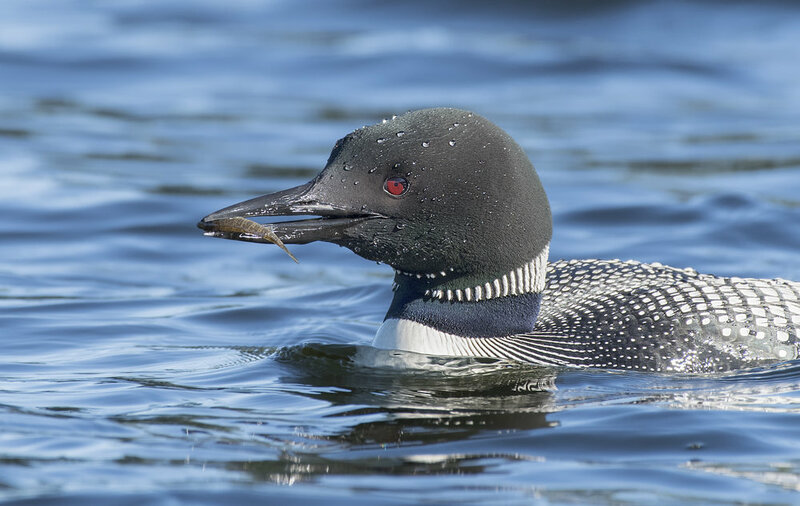 We drive north on the lake and within 60 seconds we are in front of two loons and their chick. I grab my gear and start shooting, here I have the G85 with the 100-400, GH4 shooting video with the 70-200, Nikon D500 the 200-500 and my gopro on a Gopole with a waterproof housing. I switch back and fourth between them shooting and shooting. Next thing you know I set down a camera and look back up and the family of 3 are gone? Where are they I say? Next thing you know I hear a coooo noise and something that sounded like somebodys whistling nostril. I look over the side of the boat and here they swam right beside us 😍 When Kevin is near with his boat and there is traffic on the lake the loons know he is no threat. They leave the chick beside the boat and start diving for a feeding frenzy. I can't focus with my camera and all I see is this little fluff ball calling for its parents to bring it food. Dive after dive the parents feed this little one over and over again. 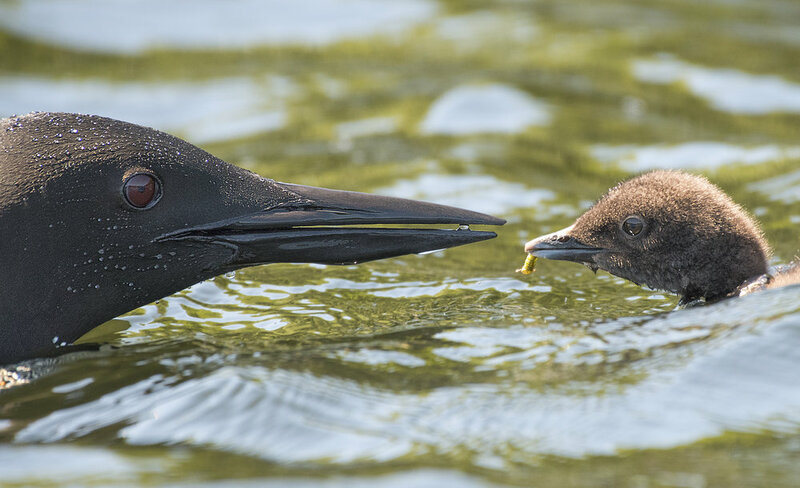 I'm absolutely amazed at the amount of work it takes a Common Loon to have a child! For a day and a half we are on the water with only short moments in-between sessions. Suddenly I'm emerged in Kevin's daily life and it all clicks. I watch and observe, specifically the parents with the chick. They constantly watch the sky for predators, they search the water and will start to freak out when large fish are in the area. They hear other loon calls and immediate tuck into a defensive mode. Boats go past us and they lead the chick along the shore lines very fast. In-between all that they are fishing constantly to provide food. Every so often the mother will allow the chick to climb up on its back and then move into a different area. 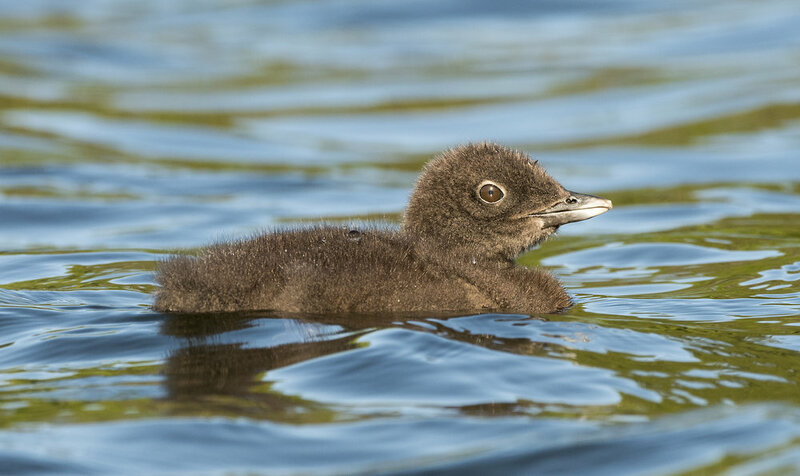 This gives the chick time to rest from swimming to lay on the safety of its mothers back.